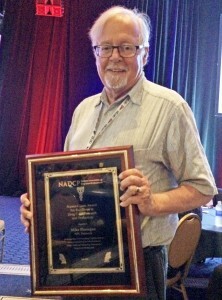 Dr. Michael Finigan, Founder/Owner and Past President (retired) of NPC Research, was recognized as a “Science Giant” by the National Association of Drug Court Professionals (NADCP) on July 30, 2015, for his ground-breaking studies of drug court programs and for developing a group of research staff who have carried on this work. More than 5,000 attended the NADCP conference where he received his award. Dr. Finigan and his team have conducted hundreds of evaluations since his first detailed outcome and cost analyses of the Multnomah County STOP Drug Court in Portland in 1998. Dr. Finigan’s work included the development of a cost methodology, Transactional and Institutional Cost Analysis (TICA), and studies demonstrating that drug courts save the criminal justice system money by reducing re-offending. These studies have resulted in increased funding for drug courts nationally, at the local, state and federal levels. Dr. Finigan worked with a multi-disciplinary panel of drug court professionals, experts and researchers to develop national best practice standards for drug courts, based on the important work NPC has conducted. Learn more about NPC’s drug court evaluation work.